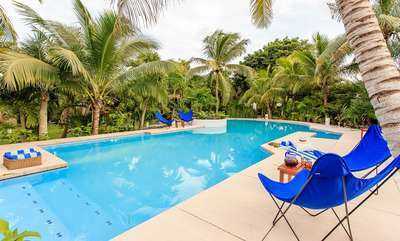 Villa Kin Ich (K'inich) meaning the house of the Mayan Sun God is a magnificently curated seven bedroom beachfront villa, architecturally dramatic, blending contemporary style with Mexican-inspired spaces. 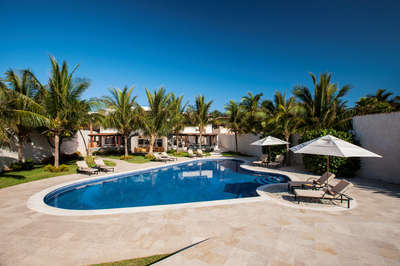 After entering the private and exclusive gated community of Playacar, it is only a few hundred meters before you find yourself at the stunning entrance of Kin Ich, a private villa oasis. Enjoy the captivating ocean views as you enter through the villa's lush corridor to find the villa's expansive exterior living and dining areas. Soak in the Caribbean sunshine by the pool or venture out a few steps down to dip your toes in the turquoise Caribbean sea. Villa Kin Ich, boasts seven large bedrooms with capacity to sleep 20 guests. Three of the master rooms direction overlook the ocean, and the additional bedrooms feature garden view. Walking up to the next level, you will feel at the top of the world on this magnificent rooftop, once again mesmerized by the incredible Caribbean turquoise blue sea. Relax and unwind with some sundowner cocktails taking in the sweet ocean breeze and setting sun. Boasting the best location that Playa del Carmen has to offer, Villa Kin Ich is the only villa that is not only beachfront but has the closet proximity to Playa's famous 5th Avenue, a pedestrian only street filled with an abundance of restaurants, boutiques international cafes, and trendy bars and nightlife. While tempting to venture out for some of Playa's famous gastronomical experiences, you will most definitely also opt for the undeniably best culinary experience with our daily chef and butler services. 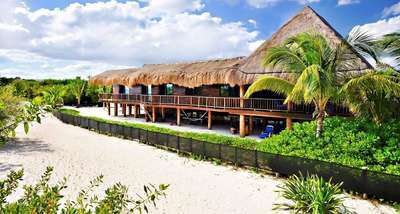 $150 per night per additional guest exceeding 14 guests. Events welcome at additional cost. Saturday to Saturday bookings required. Just 68 kilometres (42 miles) south from Cancun you will find the heart and capital of the Riviera Maya, Playa del Carmen..
Playa del Carmen is one of the most attractive destinations in the Mexican Caribbean. Here you will find a contrast of quaint, traditional and rustic architecture blended with modern and trendy restaurants, hotels and bars and beach clubs. At Playa del Carmen you will find a series of beautiful beaches looking out onto the Caribbean Sea, which are ideal places to relax or participate in multiple water sports such as snorkeling, windsurfing, kiteboarding and scuba diving in the Great Mayan Reef, the second largest coral reef system in the world. Playa is centrally located in between most of Riviera Maya’s most popular attractions such as the ecological water and cultural parks; Xcaret and Xel Ha. It’s also just minutes away from numerous sinkholes, also known as Cenotes where you can do rappelling and cave diving while exploring the amazing depths of underground river systems. Come nightfall, we recommend that you take a stroll along Quinta Avenida (La Quinta), one of Playa del Carmen's most happening areas. This pedestrian only avenue is lined with an endless array of international restaurants, trendy bars and nightclubs and features exclusive boutiques, clothing stores and jewelry shops. 59 kilometres to the airport.